Delhi in the month of September can be a touch on the hotter side. It's fact that's hard to miss, particularly if you're at the Buddh International Circuit. If wielding a camera and walking around the track saps you of energy, all you need to do to feel a touch better about yourself is to take a look at the motorcycle racers striding up and down in their racing leathers. It really helps put things into perspective, it does. 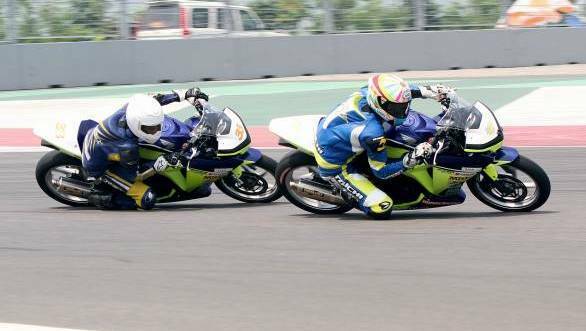 The reason we were trackside at the BIC, was the third round of the National Motorcycle Racing Championship, being held as a part of the season finale of the MMSC-FMSCI National Racing Championship. While it was the last race of the season for four-wheelers, the season just about reached the halfway mark for two-wheelers. And so it was in the sweltering heat that the first ever set of motorcycle races kicked off at the Buddh International Circuit. By the time we got there, the races were already underway, and we saw a triumphant K Rajini walking through the paddock. You see Rajini had just finished what was an epic battle at the BIC, pulling off a skilled overtaking manoeuvre on Sarath Kumar on the very last corner of the race. So, aside from the fact that he was happy with the win, what did he think of riding motorcycles at the BIC? "It's not a very technical track for motorcycles," is what Rajini had to say. Adding "It's not really suitable for small bikes, because the straight is so long and the engine is straining all through. For a fast bike, it might be much better." Another interesting thing that Rajini noticed was that given that the track was not particularly technical for motorcycle riders, it served the purpose of making the field a lot closer and tighter, because even riders without too much experience were able to get a hang of the track. Well, technical circuit or not, we were happy that the racing action was close. The first motorcycles to take to the track were the one-make TVS Apache RTR races - an affair that was convincingly dispensed with thanks to R Mathana Kumar's motorcycling prowess. In fact so dominant was Mathana Kumar's victory, that second-placed rider Ananth P Raj finished 5.898 seconds behind the leader, while Arvind Ganesh (after a three-way battle for third) took the final spot on the rostrum. It wasn't the only victory for Mathana Kumar at Round 3 of the championship, though. The second TVS Apache RTR races that took place on the Sunday of the race weekend was also won by Mathana Kumar, while Ananth P Raj finished second and SK Prakash finished third. There really wasn't a dull moment at the races. The Yamaha R15 races also saw some close action, with Shyam Shankar and Vivek Pillai trading places all through the first race. Ultimately it was Shankar who came through to win, with Pillai narrowly missing out on the top step of the podium. The second R15 race of the weekend went to Arun Muthukrishnan who was a mere 0.448 seconds ahead of Ramesh, while Shyam Shankar finished third after another battle with Vivek Pillai. But it's the Honda CBR250cc races that were the most exciting ones. As luck would have it, though, we missed the first, which was quite a thriller. Like we mentioned earlier, K Rajini won the race with a last minute move on Sarath Kumar. It was a tough race for Kumar, given that he'd led from pole and eventually lost out on the lead at the very last corner of the last lap. Abhishek V finished third. The second of the CBR250cc races was even tighter with seven riders grappling for top spot and all seven looking like they had a realistic chance of winning the race at some point. Ultimately, it was Rajini who came out tops once again. A Prabhu and Sarath Kumar who were parrying for second place crashed out on the last lap, which meant Sumit Lucas Toppo and Harshit Rao took the final two places on the podium. It was a rather glum Rajini that we encountered at the end of the first day's racing, though. In the Group C 165cc class, he'd suffered an engine failure, which put him out of contention of the race. K Jagan and Harry Sylvester finished ahead of R Deepak in Race 1. In the second race, however, Rajini found himself well entrenched in the racing action. The Chennai rider led from lights out, with K Jagan and Sumit Toppo behind him. And while it was R Deepak who managed to muscle his way into third place, Jagan eventually overtook Rajini for first, which meant the MotoRev rider had to settle for second place on the podium. What we're sure you'd be interested in knowing is that Rajini currently leads the Honda CBR250R Cup standings, although he is down in fourth place in the 165cc Experts Championship. What else is the rider up to, though? Well, he will sit out the next round of the National Motorcycle Racing Championship because he's off to the races at Qatar. 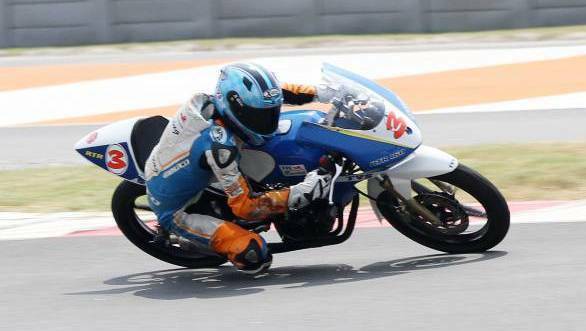 The first round of the 2014 Losail Asian Road Racing Championship is set to kick off in the first weekend of October and Rajini, having won the 600cc title in the series in 2013, has caught the attention of the QMF team and will be fielding a Suzuki Gixxer in the 1000cc class. It's a completely sponsored ride, and something that he rates as one of the biggest opportunities of his career. We might not be trackside at Losail, but we'll make sure that you get all the information you need about Rajini's first race of the season there. And we'll keep you updated on Round 4 of the NMRC too!